It’s Christmas!! I hope you are enjoying a lovely day and some rest with your family and friends. As for us Carters, we are staying local, just visiting with family (and marveling in the 70 degree temperatures we have here in DC). For a few more Christmas themed posts, check out this one (my list), this one (a Christmas survey from last year) and this one (gift ideas if you are REALLY cutting it close). 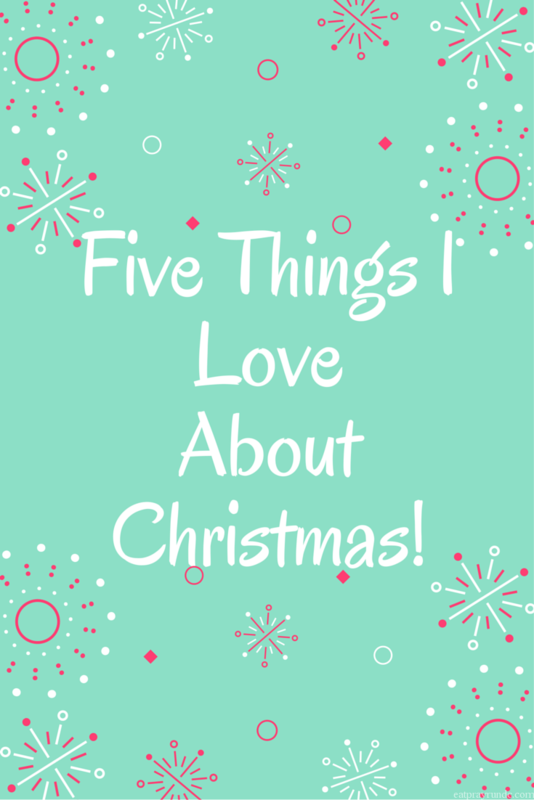 Per usual, I’m linking up with my girls Cynthia and Mar for the #Friday Five and I’m sharing five things I love about Christmas. You can read our linkup rules here – and please go check out that page because we’ve made some change to the Friday Five! Please note that if you don’t play nicely, we will delete your link. Have a wonderful Christmas and a great weekend! Celebrating the birth of Jesus. This is the reason for the season and it is absolutely my FAVORITE thing about Christmas. I never tire of reading the story of His birth. The.Best. The music. Oh yes. My holiday pop Christmas Pandora station has been in heavy rotation for awhile now and I’ll probably keep it going until well after the new year. Because, why not? The lights. I love nothing more than running through DC looking at the beautiful lights. I love it so that I organized two holiday lights runs this year and may do one more. The focus on kindness. People just try to be better – nicer, more patient and just more friendly and I can totally get behind that! The family time! Yay. I’m really fortunate to have a great family that I actually like spending time with. I know that’s not the case for everyone but we are really lucky! My family is so fun and I enjoy spending time with them (not saying they don’t also sometimes drive me crazy. duh.). Merry Christmas! My favorite thing so far this year has been our Christmas Eve service. It’s been hard for me since my Dad passed away and my kids got older, but this year it was good again. Joy to the World! All great reasons to enjoy Christmas indeed ! Hope you have a wonderful holiday. Merry Christmas! I also really love more of the Pop style Christmas music, like NSYNC! I am definitely loving this warm weather this year! Merry Christmas! This weather is confusing me, ha! Hope your day was wonderful! Fantastic reasons! Have such a Merry Christmas, Courtney! Thanks, friend! Hope you and Alex had a great one! I love the lights and the family time! Enjoy your family time! Merry Christmas, my friend! I hope your day was lovely! I love running and seeing all the lights, too. Unfortunately there aren’t many lights up this year! Is it because it’s so warm and no snow? Possibly. Merry Christmas to you1!! I love seeing friends and family for the holiday week. We have some great traditions and see friends from college (mine), b-school (Husband’s) and our first real jobs (both) – along with the in-laws and this year my brother, too. Love that! Merry Christmas to you and yours! Aw awesome! Hope it was great! Merry Christmas! My list is eerily similar to yours 🙂 My Pandora has been stuck on the Jessica Simpson Christmas station – her version of Hark the Herald Angels sing with the gospel choir in the background ist still my very favorite version of that song ever! I love spending time w family. It doesn’t just have to be for the holidays. But it surely makes it a bit more special seeing everyone for xmas! In the past I haven’t been home for xmas so I am really enjoying it this yr. This year was pretty low-key for us as well. I think we focused on the correct things: family, friends, hanging out. Not so much on the presents or stress…. Love this list! Hope you had a marvelous Christmas! love your list! I went to the christmas eve pageant at my grandmas’s chruch and loved every minute of it! I’m with you on all of those reasons but especially No, 1!!! Blessings to you this Christmas Courtney. I hope you had a great Christmas! I hope you had a very Merry Christmas Courtney! I have been listening to a pop Christmas playlist online too. I wish you all the best in 2016! I love this time of year too, Courtney. Everyone does seem a little bit kinder. I love the lights, but I miss the snow! Hope you had a great holiday. Love your comment about the focus on kindness! That is so true. There is more outward love and kindness at this time of year.